China will ultimately co-opt other countries to use their currency as reserve. This is a strategy that will be similar in all aspects to the Marshall plan that allowed the US to release domestic pent up inflation into the markets of other nations. This is what is driving geopolitical strategy as induced by the Primary Dealers and their cohorts. Man has natural possession of his own skills and abilities. But in the modern state predicated upon presumed democratic principles that extend to individuals such luxuries as the definition of the individual (self determination) and the right to private property, money is the exclusive preserve of an authority that manages it as it sees fit. Throughout the past half century in particular and regardless of the political persuasion of successive governments, modern Western states adopted a policy of constantly increasing deficits and increasing sovereign debt. This policy is directly responsible for the gradual erosion of the purchasing power of the currency thus resulting in an increase in the cost of living. But… The fact that the monetary authority arbitrarily, deliberately and constantly erodes the purchasing power of money, effectively means that when we exchange our skills and abilities for money, the exchange does not satisfy the two basic expectations of the exchange. Arithmetically speaking, since the skills and abilities of the individual are limited but monetary creation is infinite, effectively this means that inevitably, although gradually, individuals will be divested of all wealth. But monetary debasement is only one aspect of our socio/economic construct. By debasing the currency, the monetary authority guarantees that property will gradually flow towards itself. This is an arithmetical identity. But modern money is an artificial construct. Each new unit of money must be borrowed into existence. The borrowing is done first by the state. The state must therefore pay interest on the sums it borrows. As the state has adopted a policy of increasing deficits, borrowing must in turn increase accordingly to cover the short fall in funds. As the borrowing increases, so does the debt service. In order to cover the normal functions of the state AND to cover its debt service, the state must levy ever greater amounts of taxes from individuals. The above is not opinion. The above is an arithmetical reality. Below are some of the questions that should be asked if you don’t understand what I am trying to say above. a) Why is there a monetary authority separate from government? b) If the monetary authority can create money arbitrarily, why can’t government do it? c) If money can be created arbitrarily, why does government impose taxation? c) In countries predicated upon democratic principles, why must we use one type of money that is imposed by government? d) In countries predicated upon democratic principles, why was there no vote nor debate as to what money to adopt? In closing, this is what you should take away from the above. These are arithmetical realities. Most importantly, these are arithmetical realities that compound over time. A compounding dynamic is something that starts out slow but then accelerates till it goes parabolic. This arithmetical reality has preordained ramifications that manifest at the political level, the fiscal and the socio/economic levels in society. Look around! Regardless of the political persuasion of successive governments throughout the West, the result for all individuals in Germany, France, the UK, Greece or Portugal is always the constant loss of purchasing power and the concomitant increase in the cost of living. No exceptions. When this dynamic goes parabolic, the world you have known prior to this situation going critical, is not a world you will recognise and war and/or any of the 7 plagues are not far off. We are now in the parabolic phase. This is going to be a stream of consciousness post. I have just finished watching an interview with one of the great hedge fund managers whom not only confirmed my recent epiphany but also illustrated that the problem is pervasive. In the past few weeks I have finally been able to identify the crux of the problem as one of possession. When I started researching the how and why of what I was observing in real life, I quickly established that this monetary system cannot contemplate saving. Hence the reason banks discourage holding gold by charging you interest for example. But it is not till a few weeks ago that I realised how throughly captive we are regardless of what we do or where we go. The central bank has successfully drawn a boundary around society. The simple fact that you can only transact in the currency imposed by the state, whatever you do, wherever you go and whomever you elect to associate with, you are fully subject to the power of the central bank. Western society is predicated on a handful of very clearly defined pillars. One of these pillars is the definition of the individual. Another pillar is the concept of private property. But one of the most important pillars is economic freedom. By imposing the use of one arbitrary type of money, the central bank has effectively neutralised the function of private property and economic freedom. In the process, the definition of the individual has become the essential tool that guarantees that your effort can be depredated. From the legal point of view, the money imposed by the sovereign is the exclusive property of the central bank. Society is obligated under penalty of law to make use of this arbitrary money. On the other hand, the central bank has not reciprocal obligation to guarantee the value of the money. Since money is the legal property of the central bank, it is only lent to society against payment of interest. Therefore, money is inherently debt. By accepting money in exchange for your work, you are effectively exchanging something you own outright, for something you do not own and owe interest on. Ergo, by simply accepting money in exchange for your effort, you are in debt. This is borne out by the fact that even if you never take out a loan in your name, the simple fact that the central bank will always and everywhere increase the amount of money and credit in circulation, your earnings are gradually devalued. The arithmetical outcome of this fundamental truth is that regardless the underlying economic conditions, compound interest guarantees that the more transactions take place and the deeper and more complex the economy becomes, the more profit is channeled to the owner of the currency. The inevitable outcome is a state that goes deeper in debt thus a state that becomes gradually more detached from society as it becomes more intrusive and authoritarian. All the while an ever larger slice of wealth is channelled towards the owner of the currency. This is an arithmetical reality. This is the reason why in 60 years of presumed political plurality and “democracy”, regardless of the persuasion of successive governments and despite differences in style along the way, in the West the result across the board is the same. An increase in the cost of living and concomitant loss of purchasing power and wealth, high barrier to entry in business and industry thus a monopolisation of the economy thus an ever greater portion of the population that becomes unemployable. One of the preordained results of this dynamic is off shoring of course. The political, religious, ethnic and territorial skirmishing that polarizes and divides society, is in fact a God send for the monetary dynamic. Be it Fascist, Communist or Democratic the ideology that is foisted upon the public and the increasingly byzantine legislation and growing fiscal complexity that derive thereof, are pure, unadulterated, high-octane fuel for this monetary system too. In fact, the greater the malaise, the more strident the rhetoric, the more truculent the pandering, the more frequent and complex the wars or, indeed, the humanitarian interventions, the greater the profits accumulated by the owner of the currency and the entities that gravitate around it. Politics has nothing whatsoever to do with what afflicts us today and we cannot even hope to bring back some balance to society by participating in the political process. What needs changing is the monetary system itself. As soon as I realised the enormity of what I discovered, I intuitively knew this might not exist in isolation. Sure enough, other than what has already happened with the Robosigning Scandal or the London Whale, Raoul Pal confirms what I had deduced not only intuitively but also arithmetically. Having deliberately established a system that precludes ownership of anything by gradually divesting society of wealth and independence, surely other areas of the economy have succumbed to this template? Raoul Pal confirms that in fact the other area where presumed private property is compromised is in that institution where all titles are held on behalf of investors: the Depository Trust Clearing Corporation – DTCC. Many decades ago, at a time when “Capitalism” still meant something, when individuals and institutions bought shares in a listed company or, indeed, government bonds, they would receive title of ownership in the form of physical paper certificates. Today, that is no longer the case. When your pension fund buys $100M of government bonds, these are held at the DTCC. If you buy shares in IBM, these will be held at the DTCC. The DTCC however, does not allocate these instruments in proprietary accounts. Bonds and shares are simply added to a pool of like instruments that the DTCC in turn makes use of for its own purposes. If for whatever reason, as has already happened in 2007 to similar constructs ( think AIG but Fannie Mae was the bigger one), two or more parties to the DTCC pool should suddenly find themselves in dire straits, there is no legal guarantee that what you thought you owned after years of contributions to your pension fund for example, may be returned to you whole. Pensions in fact, are technically bankrupt across the West so that a minor dislocation is certain to sink them entirely this next time around. We are in a much bigger hole than we ever thought we might be in and if you work through the numbers, the options that will be foisted upon us shortly are few, dark and very well defined. I owe a debt of gratitude to a number of people whom have contributed to my own awakening over the past fifteen years. How can so many people that are clearly capable of critical thought and whom can transcend the narrative peddled by the main stream, be reluctant to admit if not unaware of what are, inherently, empirically and arithmetically, the intentions of our governments? I am puzzled but I am also concerned. I am concerned because it is entirely possible I may be misinterpreting the knowledge I have acquired thus drawing the wrong conclusions. The bright and independent minds that contribute to my personal development are the same minds to skirt what to me is an arithmetical truth. How can anyone objectively observe the real life crystallization of socio/political discourse and put it down to “idiocy” rather than infer malicious intent? This is what I am grappling with. My basic premise is that over the past 50 years, regardless the political persuasion of successive governments in the West, the end result has always been expanding deficits and sovereign debt. – A progressive increase in the cost of living and concomitant loss of purchasing power. This is an apolitical, dispassionate and empirical truth that nobody can negate. This simple truth seems to be tempered however by a sense that our quality of life has improved dramatically since the 60s. The rationale is that whatever may have been lost in the moral fabric of society, it is largely compensated for by a laundry list of “improvements”. The metrics used to support this claim however are necessarily narrow. Child mortality rates and life expectancy are the two most oft quoted metrics. The quality of health care seems to give people the impression that our lives have improved immeasurably too. Working conditions is another metric that appears to have improved. Literacy and the evolution of technology too seem to give people the impression that their quality of life has improved. This picture however hides some glaring and uncomfortable truths. The constant expansion of deficits & debt has direct as well as indirect consequences that are not only material but psychological too. Direct and material consequences pertain to the loss of purchasing power and the depletion of savings thus the erosion of wealth via the financialization of the economy thus a gradual loss of intellectual and physical freedom. Indirect and material consequences are the constant increase of the tax burden thus of the regulatory environment thus the constant expansion of the state with the moral ramification this entails. The alienation of society of course fosters the expansion of the state and, in particular, it fosters the expansion of the welfare and the security apparatus’ that in turn, lead to ever expanding deficits. Naturally, these truths do not just exist in isolation. These truths respond to a driver. Not only is there an overarching driver to the development of these dynamics but there is a definite chronology which leaves no room to wonder what came first and/or what is result and what is cause. How does the cost of living increase? The obvious answer would be to say that deficits expand because the state spends more than what it earns fiscally. True though this answer may be, it does not do justice to reality. The reality is that the expansion of deficits is enshrined in the architecture of our monetary system. The modern Western monetary system is predicated on debt. This fundamental truth has very real and tangible consequences. Our money is a political construct rather than something that has intrinsic value. In a world where nothing is owned and nothing is produced, nothing would need to be exchanged. In this hypothetical world therefore, there would be absolutely no need for money. It follows that money can only become useful if/when individuals have something they own and can gainfully exchange. Money therefore cannot exist prior to there being ownership of something thus something(an idea, an item or a skill) to exchange. Sentient beings would only exchange something they could not acquire or produce by themselves. Exchange therefore, presumes value. In turn, not only does this mean that in order to represent value the medium of exchange must be valuable too (have intrinsic value) but, most importantly, it means that in exchanging goods and services for a medium of exchange, individuals must acquire full legal and irreversible possession of said medium of exchange. But, our money is a political construct. The arithmetical reality of not only creating money prior to having anything of value to exchange but of doing it incessantly and aggressively. The entity that is bestowed the privilege to create the currency, is under no reciprocal obligation to guarantee its value. In other words, the central bank is under no obligation to back its currency with anything of value. In still other and more technical words, the central bank is allowed to operate at infinite leverage. In clear geek-speak, the central bank operates the biggest naked short scam in this galaxy. The central bank merely creates any amount of money they wish, circulates it, multiplies it and earns interest on it, but offers nothing of tangible value in return. More detrimental still is the fact that each new unit of currency belongs to the central bank. Under penalty of incarceration, society is obligated to make use of the sovereign’s currency. Each new unit of currency however is only loaned out to society but it does not belong to the individuals and companies that make up the economy. The money earned by individuals and corporations therefore, never legally belongs to them. How do you know that in our modern states individuals are not the sole rightful owners of the money they have earned? Proof is that the central bank has the privilege to nullify the value of the currency in circulation and issue new currency in its stead at whatever value it deems appropriate. This is not something that has not happened in the recent past either. Just in the past fifteen years, Zimbabwe (the poster child), Argentina (runner up), Mexico and Hungary have done just that. Those are all dinky marginal countries you say? OK then! How about Europe and, much more recently, Cyprus? The real life ramification of this monetary choice? “From Orbis 2007, a database listing 37 million companies and investors worldwide, they pulled out all 43,060 TNCs (ed: Trans National Companies) and the share ownerships linking them. Then they constructed a model of which companies controlled others through shareholding networks, coupled with each company’s operating revenues, to map the structure of economic power. Clearly, our monetary system is geared to effect wealth transfer. More interestingly however and assuming we do see how this monetary system fosters the transfer of wealth, how do we go from there, to understanding the direct and indirect ramifications that are as much material as they are moral, environmental and psychological? In a first instance, it helps to realize that in our presumably open and democratic societies, the choice of monetary system was never put to a vote. None of our leaders, anywhere, took the time to propose competing monetary systems outlining the pros and the cons of choosing one system over another. Come to think of it. Is it not extraordinary that in 1971 all European sovereign governments should have all simultaneously agreed to abandon their respective monetary systems and all unanimously and simultaneously adopted the current system? Improbable though that is, that was the single most unanimous decision ever taken by otherwise tetchy sovereigns and fractious societies in the history of the world. This monetary system was imposed unilaterally and arbitrarily upon society. Moreover, in ostensibly capitalist economies, the monetary system is managed by decree by an unelected entity. How’s that for democracy and capitalism? Clearly, in 1971 Europe, someone deemed it desirable to impose this monetary system. This is the manifestation of intent. And the vehicle was politics. Here we begin to see how, though symbiotic, the political dynamic is subordinate to the financial dynamic. No chicken-or-egg dilemma here then. We have already covered some of the material ramifications of adopting this monetary system in that it can only exist in an environment of expanding deficits and credit markets (inflation) thus fostering a loss of purchasing power. The corollary of the loss of purchasing power is multifaceted of course. Initially, continued aggressive inflation fosters a rise in the cost of living and the expansion of credit markets. The loss of purchasing power drives both increased consumption and expedient politics. Expedient politics drive the depletion of savings because the state ostensibly has your back of course. The depletion of savings makes individuals dependent on government and drives accelerated consumption thus the expansion of credit markets. As the monetary authority peddles a policy of decreasing interest rates, individuals become ever more dependent on government and ever more indebted because governments will always lower rates of interest… will they not…??? So debt does not matter right? The constant increase in the cost of living not only fuels the political dynamic but it also subverts fundamental concepts till new aberrant paradigms become commonly accepted as true and necessary. From an arithmetical point of view, electoral politics guarantees that politicians have nothing to gain from promoting the dismantling of previous promises and programs. Electoral politics cannot contemplate to offer less or to undo previous promises which, as it happens, is a blessing because this particular variety of monetary system depends on just this reality – i.e. increased spending at any cost. This arithmetical reality is amplified by making politicians immune and unaccountable of course. Electoral politics therefore, is free to promise the moon with no consequences. So, a monetary system that is predicated on the debasement of the currency effectively fuels a political process that hinges on aberrant promises. Indirect & Material consequences of this monetary system. Riding on the coat tails of the constant erosion of purchasing power and the concomitant increase in the cost of living, electoral politics guarantees the expansion of the welfare state – i.e. education, healthcare and security to name but a few notable examples. This dynamic in turn guarantees the expansion of state budgets which in turn, guarantees an increase in the tax burden. An increase in the tax burden goes hand in hand with increased regulation which, in turn, fosters the expansion of the regulatory capabilities of the state which result in the expansion of the enforcement capabilities of the state – i.e. the expansion of the security apparatus. The result is a spiraling cost of living along with the constant expansion of the state & security apparatus’. As the fiscal burden increases and the legislative labyrinth becomes ever more convoluted, entry barriers to business and commerce are progressively raised thereby inducing monopolization of industries and commerce as well as the advent of state champions. The corollary to an increasing tax burden of course is the question of at what point does anyone no longer own anything they buy. For example, at what level do property taxes make the house you have “bought” mere rented accommodation? 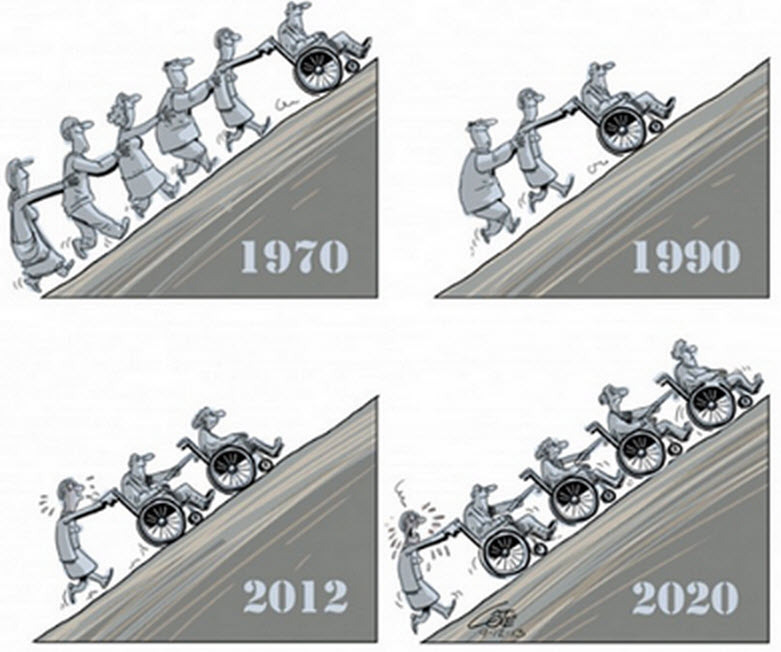 This cartoon is taken from a post on Zerohedge (h/t) and although it was originally intended to portray the reality of Western healthcare, it is an apt metaphor for the overall state of our sovereign finances. Just picture the wheelchair as the state. Direct & psychological consequences of this monetary system. Foisting this monetary system upon society must inherently be facilitated both by academia as well as by opinion leaders through media. Imposing what is an otherwise aberrant system must be sold gradually but persistently through a variety of channels till a number of fundamental concepts are subverted in the psyche of society. The existence of this monetary system can be neither sustained nor justified if society does not divest itself of responsibility towards its own welfare and security. This monetary system cannot be sustained if society holds on to “archaic” concepts of wealth creation and personal responsibility largely reflected in Capitalistic ideology. Once again, electoral politics is instrumental in order to mollify society into accepting what would otherwise be an abomination. Electoral politics steps in by making promises that though intellectually alluring, are arithmetically unsound. Anyway, electoral politics guarantee a diminishing sense of fiduciary duty so that cronyism, waste and corruption are guaranteed. For their part, the central bank and its allies are only too happy to indulge the “system” by, for example, implementing a policy of constantly lowering interest rates. Subsidies and special regulation soon become the rule rather than the exception. As more populism pushes the boundaries of what is economically viable if not morally decent, politicians and civil servants become imperious and untouchable as the coffers are being depleted and the population is either fully captured or alienated. At some point the cost of living has been pushed to such heights and the state becomes so pervasive that moral hazard fully captures society till individuals can no longer stand up for what they believe is morally right under penalty of losing their “life style”. The constant and aggressive increase in the cost of living along with a state that purports to fully take care of the individual, coupled with the subversion of fundamental concepts peddled by academia, fueled by populism and abetted by the increasingly liberal availability of credit, chip away at those social constructs that build responsible productive societies based on tolerance, respect and work. The breakdown of society manifests in many ways. In a first instance, the erosion of wealth inherent in the system guarantees a shrinking middle class. At the same time, the erosion of a sense of personal responsibility induces the alienation of youths that, at best, grow into apathetic dependent adults or, at worst, into violent criminals out to get rich quick or die trying, leaving destruction and misery in their wake. In either case, the moral and material fabric of society is perverted and destroyed leading inexorably towards the polarization of society between the “haves” and “have nots”. But…. There is a “but” of course. In an unhampered market and in the absence of expedient politics, this monetary construct also guarantees its own arithmetical destruction. It is an arithmetical reality coded into the DNA of this monetary system. What you see above is the arithmetical reality induced by this monetary system. This simple graph hides myriad truths that are not readily fathomable. In a first instance, the individuals that have imposed this monetary system are aware of this reality. That being the case, the first conclusion that we can draw is that the sponsors of the system will necessarily intervene in order to stretch out in time this dynamic. In arithmetical terms, this dynamic can only be lengthened by enlarging both sides of the equation. So, GDP and Debt must increase simultaneously. If either side grows faster than the other, than one side of the equation is overwhelmed. This is the point at which we enter the twilight zone. This is the point at which you may wish to take a break and digest what you have read so far. From now on, I will venture into a series of inferences that nonetheless are very well buttressed by reality. 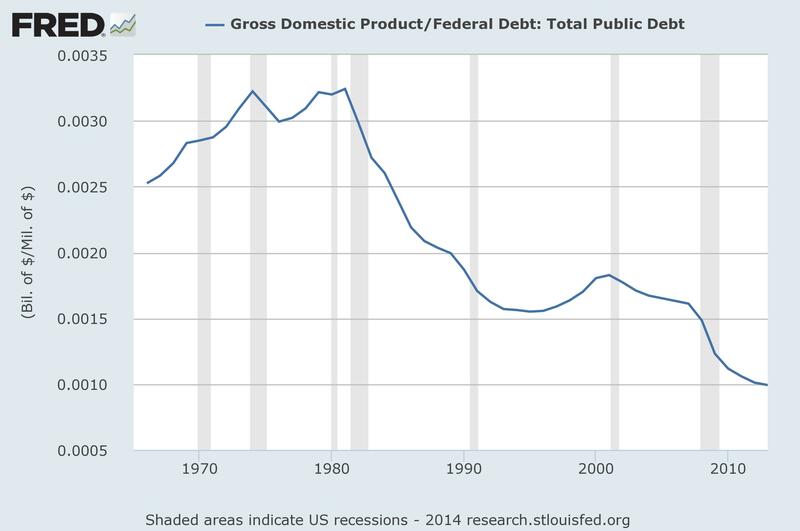 Empirically, when we observe the graph above, we know that the debt side of the equation has been outpacing GDP not by a little. 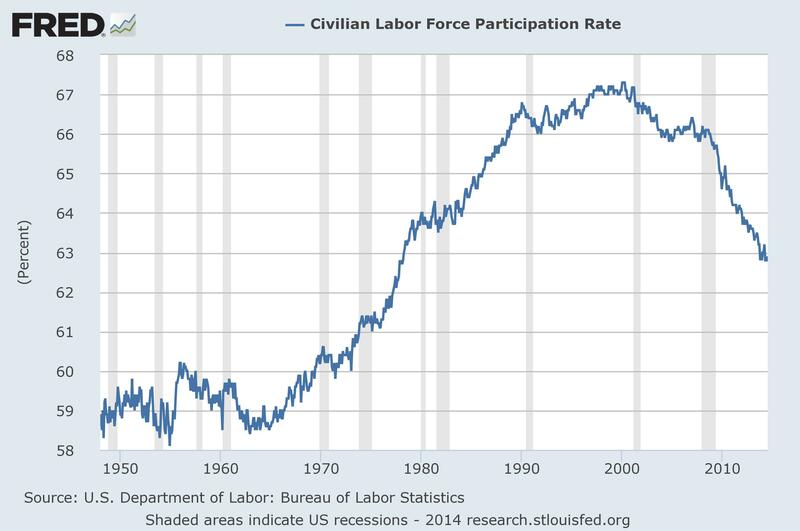 In fact, this chart tells us we are currently knocking at the door of the singularity. We understand how by making this money the only legal medium of exchange AND by simultaneously devaluing it, this monetary system effectively captures society, physically, morally and productively. This is a dynamic that plays out over generations and is, to all effects, the typical pyramid scheme. Nothing highlights the pyramid nature of our socio/economic construct than Western Social Security. The men and the women that took their retirement in the 70s and 80s made out very well. Those that took their retirement in the 90s also did well although rumors were already circulating about a brewing crisis. Empirically and unless one is a politician or a civil servant, those taking their retirement today and scheduled to retire this decade, are looking at significantly curtailed services and pensions overall. The postal system is bankrupt. Road maintenance funds are grossly in debt as are the funds for education and public transport. Municipalities and city governments throughout the West are creaking under the weight of debts accumulated over years. Pension funds across the board are increasingly underfunded. And despite the fact that our governments are now peddling the notion of “austerity” saying that it is not only patriotic but it is in fact the new black, through it all, our governments expenditures have not abated one iota. Quite the contrary, our government expenditures in Spain, Italy, Portugal, Greece, France and everywhere else have increased merrily and with abandon. The sovereign machine is still expanding and is demanding instead that the people sacrifice their wealth and well being to support the machine. This variety of monetary system is not new. It has been tried several times before. The Chinese experimented variations on the theme at a time when the West was still eking a living with flints and rocks in their hands. In the 1700s, the French gave this system a whirl too under advise of John Law a bright businessman from Scotland. In more recent times, tin pot dictators and despots the world over have tried it too and all, invariably, brought about exactly the same result. Knowing what we do from history and with a modicum of intellectual acumen, we inherently know what the ramifications of this policy will be. It may take ten years or it may take a century. But the result is guaranteed and is known. Given all of the above how is it possible that most observers, pundits, politicians and economists are unable to see let alone admit malicious intent? This reality is not in doubt. This reality is not conjecture. This reality is certainly not subject to interpretation political or otherwise. How or why would anyone believe that spending even more money at this point might bring about an inversion in this reality? You don’t have to be an economist to realize that in a world of ever expanding deficits and debt, the past 40 years have brought us to this point. Why would more of the same make things better at this point? Why do individuals still believe that change can be effected if only a Republican rather than a Democrat administration were put in power? Or a Christian Democrat one instead of a Reformed Communist or a Labor rather than a Tory one? Obviously, the solution cannot be political. There is obviously something else at work and political ideology is not it. If regardless the political persuasion of successive governments the result is an increase in the cost of living and the erosion of purchasing power, clearly there is another force at work. If I was able to make you understand the arithmetical reality of this monetary system then the rest of my rant should also come into focus. Lenin is said to have declared that the best way to destroy the capitalist system was to debauch the currency. By a continuing process of inflation, governments can confiscate, secretly and unobserved, an important part of the wealth of their citizens. This dynamic gives rise to a number of consequences and realizations. Given the diminishing marginal utility of debt, it is clear the sponsor of the system has a vested interest in expanding adoption of the system far and wide. The limits of this monetary system have been amply demonstrated in times ancient and current. Remember Zimbabwe for example. The only difference between Zimbabwe and what we do in the West is in fact the size of the market available to our currency. In other words, the only difference is the size of the pyramid. Western currencies are convertible and accepted by other sovereigns thus inherently widening the circulation of the currency. In actual fact however, there is only one currency that matters. The reality of our respective monetary systems in the West is that the common denominator is the US$ – The US$ is our reserve currency. If you are Zimbabwe and your currency only circulates in a limited area around your country, you will reach the limit of the system in very short order. If you are the US and your currency is circulated far and wide, the limits of your system will take longer to be reached. But in order to make your currency accepted far and wide, you need opportunity. This is the point at which a number of events of the recent past can come into focus. Things like WWI and the roaring 20s; the Great Depression, WWII and the Marshall Plan; the UN, the World Bank, the IMF and Bretton Woods… till, more recently, the European Union and the Euro. Given the natural tendency of the system to transfer wealth towards the sponsor of the system, the arithmetical reality, uncomfortable though it may be, is that the financialisation of the economy is the logical outcome of this system. As nominal (financial) value is driven away from intrinsic value markets are assimilated globally. But to return to the original intention of this post. Once we come to terms with the ultimate driver of our socio/economic/political life, how can anyone believe that the aberrant policies that are foisted unto the public at an accelerating pace are the result of idiocy and stupidity rather than intentional and dictated by an authority higher than the political government? Think about the legislation that is being debated and, in many instances, passed into law in the West today. Just in the recent past, think about the IMF suggestion for the 3rd time in two years that pension funds should be confiscated to alleviate the debt burden of the state. Think about the irrational and unfounded demonization of Russia and Putin in particular. Think about the irrational intervention in Iraq. Think about the aberrant fiscal maneuvering in Spain, France and Italy that are all attempting to strip personal wealth by decree. Think about the bankers caught time and again red handed in fraud, drug money laundering and fixing the very lynchpins of our economies with yet nary a prosecution or conviction. Think of the legions of politicians that are caught neck deep in corruption with few, if any, prosecutions and convictions. Think of the pretexts for interventions in foreign countries half way across the globe which cost thousands of lives and billions in treasury to then finally negotiate a “settlement” that is not different than when we first arrived. Think of the deliberate distortion and misrepresentation that has come to light in climate policy. Think of the arithmetical aberration that are the United Nations that for all intents and purposes are an unelected government financed, as it is, out of our respective sovereign deficits and that, despite expanding by leaps and bounds and occupying some of the most prestigious real estate in the West, have singularly failed to achieve any of their stated charter goals in the 60 years of their existence? And that despite the gargantuan budget at their disposal are chronically short of funds and yet, between September and December of every year, regularly engage in the art of blowing whatever moneys may be left on their budgets so they can get more the following year! At what point does circumstantial evidence become incontrovertible proof of malicious intent? Secession and independence could be a good thing. It is not true that a sovereign needs resources in order to be able to make a go of independence. Examples of successful resource poor sovereigns abound. Clearly however and as demonstrated above, if in independence the new country keeps the currency of another AND imposes it on its people, then the political process will be fully dependent on the country whose currency it is holding. Some of you may know I recently married and that my wife Rula is expecting our first child. As we pre-plan our child’s early life, one of the things we came across was the possibility of saving and storing the baby’s umbilical cord so that he/she may have access to his/her own stem cells if and when needed in the future. We live in Jordan, in the Middle East. When Rula first mentioned the possibility of saving and storing the baby’s cord, I thought that whatever company would do that would store the cord in the same country where the baby was born or, at any rate, in the country of nationality of the baby. The reason I thought that, is due to the controversy that surrounds all things DNA, stem cells and biological identity. As things turn out, the companies that operate in Jordan in fact store the tissue in the UK. In fact, there are a number of companies that are licensed to carry out this type of work globally and it seems that China is at the forefront of storage and use of stem cells. However, China not being recognized neither by the FDA in the USA nor the European body (which name now escapes me) nor the UK’s Human Tissue Authority, their work is not included in worldwide statistics. Interestingly, we are told that in the early stages of this activity in the UK, companies were being licensed by a body other than the Human Tissue Authority. But eventually, government questioned the relevance of this private body issuing licenses for the collection and storage of human tissue and set up the HTA as a government agency. The long and the short of the story is that Rula and I will do this. We do it willingly because it is a good thing. Nonetheless, I cannot but be torn by my awareness that I am willingly giving up a significant portion of my child’s freedom… without my child’s consent. Readers of this blog know I maintain our economic/social model evolves according to a logic dictated by two overarching dynamics: the first is the choice of monetary system and the second the choice of political system. As you by now know, though symbiotic, these two dynamics do not affect our lives equally the monetary system being the ultimate driver whereas the political system is subordinate thus is the proximate driver of all human dynamics. Moreover, despite the fact that the monetary system is the ultimate driver, the choice of system is not subject to society for ratification. In other words; governments, particularly Western governments, ergo governments of open democratic societies, retain the exclusive and arbitrary right to impose the monetary system. Throughout the Western world, all be it at different times, our respective governments have imposed a debt based fiat monetary system upon society. Though not necessarily destructive, the political process ensures that debt based money always and everywhere will end in a catastrophic collapse. The only variable is time. The reason is that debt based fiat money is predicated on inflation and inflation is a dynamic that conforms to the laws of diminishing marginal utility. This means that you progressively need more inflation in order to obtain the same result. This is not opinion. It is a mathematical truism. What is relevant here, is that as the debt based fiat monetary logic evolves and as inflation loses traction over time, the only way more inflation can be brought to bear is if government progressively becomes more involved in society and the economy. Thus as the effect of inflation inevitably wanes, the end of a debt based fiat monetary system is characterized by big government. But big government is inherently and by necessity intrusive thus ever more statist thus ever less democratic. This is nothing new. 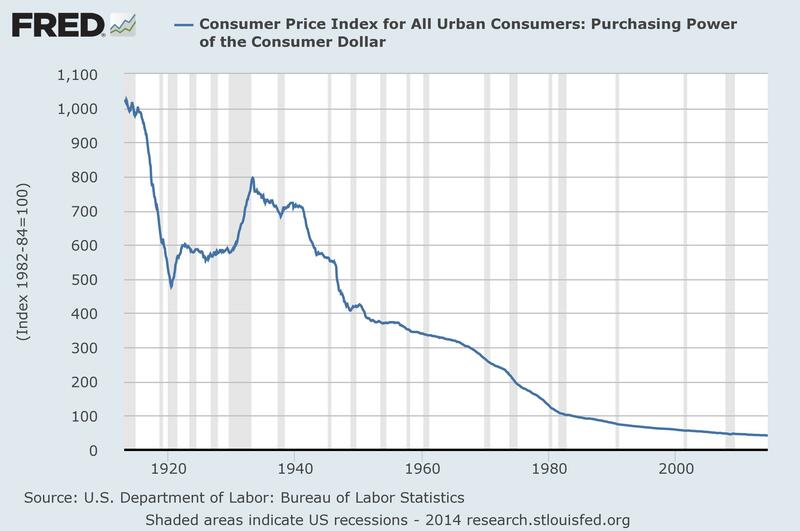 It has happened before so this should not be and is not a surprise to anyone that can grasp the very simple logic of debt based fiat money. At a time when government is clearly, blatantly and overtly flouting the black letter of the law for the ostensible good of “the system”, how much more proof do you want to realize that we are now well into dictatorship territory? How about a candid admission of manipulation at the highest level? Recruiting children to spy on your neighbor. That’s what the champion of freedom and open society has come to. So if you understand the dynamics brought about by debt based fiat money, then the fact that today we are effectively living under a developing dictatorship should not be a surprise. We may not have reached the acute stage yet but the mathematical character of the monetary system ensures an accelerating dynamic so that events will follow at a quickening pace. Back to the point of this post: my child’s biological identity. Today, “security” is everything and everywhere. Our lives have been turned upside-down and inside-out by threats real and perceived and often by threats that are contrived and carried out by a myriad anonymous “security” agencies that have no overall supervision from any institution civic, military or government it may be. Personal freedoms are being curtailed at an increasing rate, youth organizations are being militarized, teenagers are being encouraged to learn the craft of spying and identification data is being forcibly collected and stored about individuals before they are even suspected of doing anything suspicious. This is what happened to innocent till proven guilty. Today, we are all guilty till proven innocent. Once upon a time the “old country” was a land where people could only do what was allowed by law so that America, the land where people could do anything provided it was not forbidden by the law, flourished. The difference in the two approaches ensured that in upholding the presumed inherent goodness of man, America allowed people to imagine and create things that did not exist whereas in the old country, government would give guidelines in what to imagine and what to create. To be sure, both approaches created some degree of wealth and somehow advanced society and both approaches can be deemed to have succeeded depending on what the parameters for success are. Nonetheless, the personal freedom approach was much more prevalent in America than in Europe hence no doubt contributing in a significant manner in turning the USA in the global hegemon. But I digress. I am now about to give up what could very well turn out to be a significant portion of my unborn child’s identity and place it in the hands of government. Sure the company that will collect the cord claims that nobody but the parents have access to the tissue but in light of Western governments increasing and proven inclination to hold themselves above the law, I know the genetic identity of my child will wind-up on a government database. From there, government through any of the myriad agencies under its presumed control will have significant latitude in using and misusing this information. Some of the possibilities have been illustrated by authors young and new. Some their work was deemed fiction or science fiction when it was first published. But today, we see the long dark hand of government stretching over society ostensibly to provide protection; protection that can only be offered by curtailing your personal freedoms to save you from yourself. In recent years a minor movie I thought was deserving of attention, if not recognition, was Gattaca. The Berlin wall only came down twenty years ago. That was the point at which “free” society thought it had overcome by wielding truth, justice and personal freedoms. We are fully back to square one but this time it is global. That is what is occupying my mind these days.